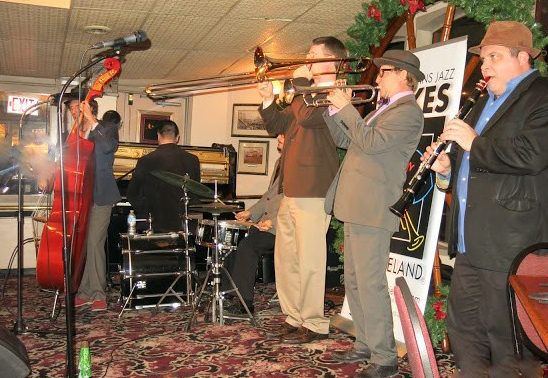 The Dukes of Dixieland have been around New Orleans for decades. They specialize in traditional New Orleans jazz. 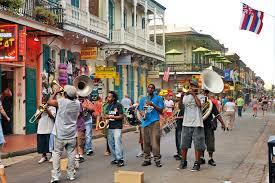 Street music is a New Orleans tradition. THE 'BIG EASY' is big fun. It's not hard to "laissez le bon temps rouler." The city is celebrating its tricentennial this year, with all the jazz and pizzazz one expects from one of the country's most colorful towns. Celebrations began on New Years Eve, honoring the diversity, energy, come-back energy and artistic accomplishments. Iconic buildings and tour buses abound. Above is the famous Gallier Hall. Celebrities, including native son Harry Connick Jr., have been in on the festivities. He is one of many famous New Orleanians. Satchmo leads the list -- aka the endearing trumpeter and singer Louis Armstrong. The talented Marsalis family is rooted here. Dance and music come alive daily. 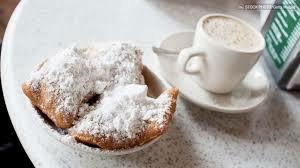 Beignets and coffee at Cafe du Monde are a tradition. 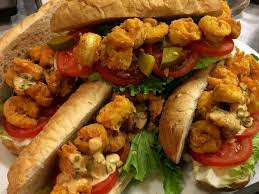 make up the city's famous "po boy" sandwich. celebrates the city's music and art. Below, a paddlewheel plies the river. Norma Wallace, whose pleasure palaces were legendary. GOTHIC NOVELIST Anne Rice was born here, as was writer Truman Capote. Award-winning radio host Cokie Roberts is a native daughter. The city's founder was a Frenchman named Jean-Baptiste LeMoyne, Sieur de Bienville. He liked the lay of the land at the mouth of the Mississippi River and named city center Place d'Armes. Colonists flocked in to what soon would become the French Quarter. has a large, proud and philanthropic Jewish community. The French ruled until 1763 when the Spanish took over. It reverted to French control in 1803 then was sold to the U.S. in the Louisiana Purchase. NEW ORLEANS folks are fun-loving, but they are also resilient. Hurricane Katrina's devastation can still be seen, but the townsfolk came together to rebuild, after the 2005 disaster and levee failure. Plan to spend at least four or five days to take a plantation tour, enjoy the garden district, live jazz, zoo or aquarium, and soak up the French and Spanish architecture that mark the city. Gallier Hall has had a major post-hurricane facelift, the Louis Armstrong Airport is expanded and Bourbon Street has been spruced up. EATING IS an art in New Orleans, which many consider one of the world's best dining towns. Jazzercise takes to the USS Midway deck Saturday, Oct. 20, in a fundraiser for cancer research. Fun for a good cause. UP NEXT: Jazz it up on the Midway Oct. 20 with Jazzercise Dance for Life! Thousands of dancers will take over the deck of the USS. Midway in San Diego for an 8 a.m. to 10 a.m. workout to benefit breast cancer research and the struggle for a cure. Instructors from around the world will participate. Let the good times roll, indeed! Fun story and photos....happy 300th, Big Easy. We are in N'awlins now. No place like it. Thanks for the timely insights. Always enjoy your diverse and lively travel pieces. Fun variety. Your story and photos made me yearn to return...and I am hungry now, too.